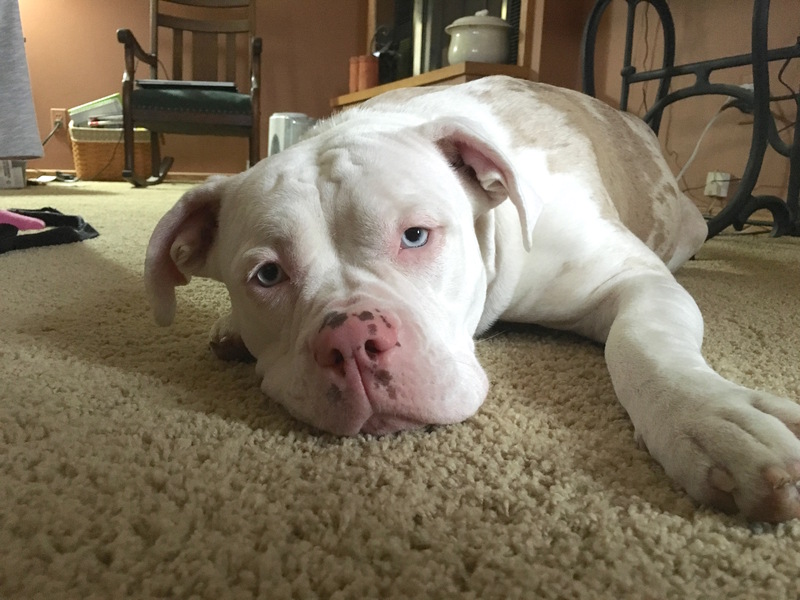 Margie is a seven-month-old female Alapaha Blueblood Bulldog puppy who doesn’t always recall, is a selective listener chews, pulls on leash and whines when her guardian is not home. Margie displayed a really soft and playful energy when I first met her. She greeted me with her nose first which is always a good sign for any dog. After giving me a good sniff, she did attempt to jump up on me and her and excitement level started to rise. But all in all a very good greeting for a puppy. Once I came into the living room, Margie’s energy continued to increase. At one point she started running around the room including running across the couch as if it was a part of an obstacle course. I used this opportunity to show her guardian how she can utilize a leash to disagree with this rambunctious behavior. When it comes to correcting a dog or disagreeing with it for engaging in an unwanted action or behavior, timing is everything. Dogs learn through association and they do not have deductive reasoning. If your correction comes to late, the dog is unable to connect it to any specific behavior which means that your correction accomplishes nothing. I explained this to Margie’s guardian stressing the importance of careful observation, especially at times and places when the dog is most likely to get into trouble. Most people only try to correct their dogs from unwanted behaviors when they’re engaging in them. This usually occurs when the human’s attention is focused elsewhere. In other words, when the human is not prepared for it. As a result of this unpreparedness the humans reaction is often too late. This is why I try to stage scenarios that will tempt the dog to break a rule or engage in an unwanted behavior when I have the time to observe it. After all, there are no entrapment laws for canines. Essentially you practice disagreeing with the unwanted actions of behaviors by recreating them under a controlled setting. Anytime that Margie’s guardian observes her engaging in an unwanted action or behavior, she should use her imagination to try to determine how she can re-create that scenario and then practice it with the dog so that she can disagree with good timing. If you disagree with the dog before it starts to do something you don’t want with good timing enough, the dog simply stops doing that thing. To help Margie better understand what it is her guardian wants or does not want from her, I spent the next few minutes going over some new nonverbal communication cues. Because she will become a very powerful dog, it’s going to be important for Margie’s guardian to start practicing the enforcement of rules and limits now. The sooner that the dog gets accustomed to taking direction and corrections from her guardian, the more effective that these techniques will be later on in her life. Another big factor that is likely contributing to Margies unwanted behaviors is an abundance of excess energy. While her guardians have a large backyard, they were not able to get fencing in before the ground froze. Fortunately there is a large field nearby that is fenced in. I suggested that the guardian take the dog to this field daily with a large quantity of high-value treats. This will give the guardian the ability to practice recalling her dog on command. But before the guardian starts practicing the recall exercise outside, it will be important that she master it inside. You always want to start training a dog in the easiest possible version of that exercise. I spent the next few minutes showing Margie’s guardians how to use a hand signal and motion to entice the dog and condition her to recall to them on command. By practicing calling the dog over when it is on the opposite side of the room or in another part of the home, we can condition it to understand that coming to a human that calls her will result in a reward for Margie. With enough practice inside, the recall would become second nature to the dog when she is in the field across the street. Next I pulled out a Martingale collar and showed Margie’s guardian how to apply the special twist to the leash. I also went over the rules and techniques that I use when taking a dog out for a structured walk. At first Margie’s guardian was reacting far too slow when the dog got out of position. It’s incredibly important that we disagree or correct dog the instant gets out of line or whenever possible before it does so. The correction on a Martingale with the leash this way is a quick tug upward, never back. As we continued on the walk, Margie started to understand the position that her guardian wanted her to stay in. Additionally the guardian’s technique and timing got better. It was great to see Margie walking next to her guardian in the heel position with little correction needed after only a few minutes. My goal was to wrap up the session by showing Margie’s guardian how she can provide a little extra structure to the feeding ritual. Because this is an activity that the guardian will repeat multiple times a day for the rest of the dog’s life, adding a little structure and discipline to mealtime is a great habit to get into. As we were wrapping up the feeding ritual suggestions, Margie’s guardian mentioned that the dog is sometimes nervous about going into the kennel. Because we had already passed the time limit for the session I showed the guardian a very truncated version of the exercise I use to help a dog learn to enjoy being inside of a kennel. If Margie’s guardian continues to have difficulty with the dog and the kennel, it may be necessary for me to return for a follow-up visit to focus on the kennel. But by the end of the session I was quite pleased with the changes in Margie’s behavior. She was no longer running on top of the furniture as if it was an obstacle course, was looking up to her guardian for guidance and corrections and already starting to follow some of the new rules on her own. By petting the dog with a purpose, introducing and enforcing rules, boundaries and limits using the escalating consequences and providing the dog with a sufficient energy outlet every day, Margie’s guardian should notice a big improvement in her dog’s behavior. By maintaining this discipline and structure for the next few weeks, these new behaviors will become second nature to both dog and human.